Since this year, many bridges such as the Daoqiao Bridge, Nange Bridge, Jiuqu Bridge and Sima Bridge have been repaired and rectified. The traffic restrictions caused by the maintenance of bridges have affected people's travel and have also attracted public concern. In this regard, the relevant person in charge of the Municipal Local Highway Administration Station (hereinafter referred to as the Local Highway Administration Station) told the reporter: Most of the bridges under the management of the Central Highway Administration Station have low construction standards, coupled with serious vehicle overload, ship collisions, etc., and serious bridge diseases. , has entered the maintenance and remediation of the dense period. 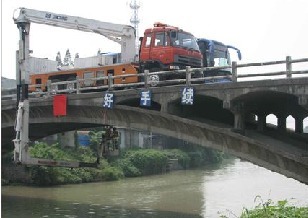 According to reports, since 2011, there are 49 bridges in Dongguan that need maintenance and remediation. A total of eight remediation projects have been completed. There are a total of 41 planned and planned remediation projects in the near future. The rectification of these 41 bridges has estimated an investment of about 300 million yuan. â€œThese bridges responsible for the management of the local highway management stations were mostly built by the villages and villages in the 1980s and 1990s. The construction standards at that time were low, and the carrying capacity of the bridges was originally limited.â€ Deputy Station of the Local Highway Administration Station Chang Yuncai said, â€œAfter these bridges are built, they are catching up with the rapid economic development period in Dongguan, the high utilization rate of bridges, overloading of vehicles, and the serious collision of ships against bridges, which makes the bridge diseases increasingly serious.â€ In addition, river water pollution on bridge erosion and other factors also exacerbated the bridge disease. According to statistics, after the inspection of the local highway management station, a total of 49 bridges have been proposed for maintenance and remediation projects in recent years. These 49 bridges involve 15 towns and streets, such as Daobu, Gaochun, Hengli, Humen and Wangniudun. The number of prefectural road bridges with Humen problems is the highest, and the number reaches seven, accounting for one-seventh of the total. "This is also the reason why remediation has had the biggest impact on Humen." According to the introduction, for the county bridges within the jurisdiction, after the local highway management station passes the technical inspection, it will make a category assessment and propose specific remediation plans according to different categories. According to the data provided by the local highway management station, most of the 49 county road bridges were rated as Category 3 and Category 4, which means â€œin poor conditionâ€ and â€œin bad conditionâ€. Humenâ€™s Dongfeng Xiaoqiao, Changping-Cross Railway Bridge, and Zhongtangâ€™s east-facing small bridge are rated as Category 5, which is â€œin a dangerous stateâ€. In addition, there is no rating on Yuanjiang-Chanongdong in Changping, but according to regulations, it is necessary to dismantle the reconstruction because it does not meet the requirements for flood discharge. Liu Yuncai introduced that a total of eight remediation projects have been completed. There are 41 bridges and culverts planned to be rehabilitated in the near future, of which 25 are required to be repaired and reinforced, and 16 are required to be demolished and rebuilt in all or part of the structures. According to the person in charge of the local highway management station, under normal circumstances, the implementation of a high-lift gantry or a bridge for demolition and reconstruction will have a greater impact on the people's travel. At present, the demolition and reconstruction of the Yokohama Bridge is being organized and implemented by the Dongguan City Road and Bridge Corporation, as well as the Takahata Bridge, the Shenshan Bridge, the Humen No. 1 Bridge, the Humen No. 2 Bridge, the Jinsha Bridge, the Seaview Bridge, the Daoqiao Bridge, and the Nange Bridge. Waiting for a bridge will have a greater impact on traffic. According to reports, in addition to these bridge rehabilitation projects that have a large impact on traffic, there will be seven bridge maintenance and renovations. It is understood that according to the "Code for the Maintenance of Highway Bridges and Culverts," the bridges that are rated as Category 3 should be subject to traffic control as appropriate; the bridges that are rated as Category 4 must be timely traffic-controlled, such as limited-load, speed-limit passage, when the defect is relatively Traffic should be closed when severe; bridges rated as Category 5 should be closed in time. At present, the traffic control measures taken by the local highway administrative station in the city are generally limited warning signs and ceiling gantry. According to the current capital construction procedures, it usually takes 1 to 2 years for a bridge maintenance project to be completed from the proposed remediation plan to the completion of renovation. Some of the bridges are complicated because of the remediation plan, and their remediation time is longer. â€œExercise restrictions on some over-restricted vehicles, including buses, have caused inconvenience to the production of neighboring enterprises and the travel of the masses, and have had a great social impact. After the implementation of traffic control, the pressure on the protection of bridges and traffic safety as a management department is also high. "Liu Yuncai said, "We will also publish traffic control information in advance through our Weibo@Dongguan local highways and media so that people can choose a faster way to travel."